THEY TWEETED WHAAAATTT? 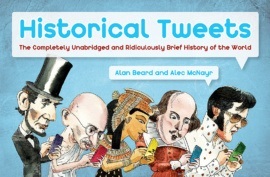 History’s most famous personalities share their ridiculous, scandalous, and humorous thoughts. From the ancient tweets of @Plato and @Cleopatra to modern updates from @Gandhi, @Hitler, and @Elvis, Historical Tweets has all the answers to history’s biggest questions: What happened to the dragons? What does “four score” mean? WWJT? For those who can handle only 140 characters’ worth of history at a time (and don’t mind breaking their history teachers’ hearts), this is the perfect book.